Casey Chamberlain is a second year Bachelor of Fine Arts student. In this blog she is reflecting on her experiences in Malaysia in October 2015….. I taught in the grade 5 classroom with my team: Kate and Afiq from QUT and Syu, Ain, Kim, Aishya, Nadhirah and Munirah from UPM. Our lesson plan included a combination of the narrative structure of stories, deforestation, and movie making. 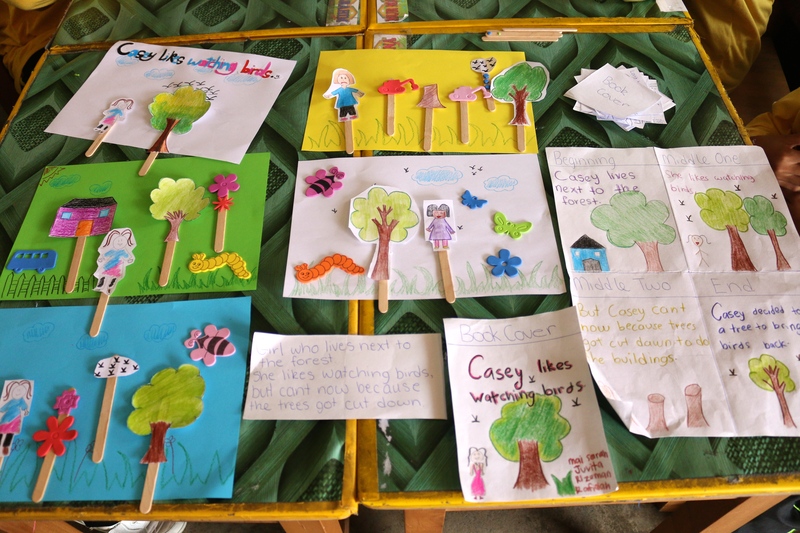 The result saw the children create their own story based on the theme of deforestation with which they created a movie clip, using drawings, popsicle stick characters and a voice recording. They edited their films with the program Open Shot by syncing the pictures to the voice recording and adding transitions. When we first entered the class, the children were very shy and reluctant to speak to us in English even though they could understand us. This made the existing language barrier even more of an issue to begin with. But after the second day, the kids opened up and felt so much more comfortable communicating with us. It also made a massive difference to have the UPM students translating to make sure no one was left behind. The greatest moment for me was seeing the kids use the laptops and learning how to simply use a touch pad. They saw dragging and dropping a file as a game and gasped when the cursor went outside of the file box. It was so rewarding to see the mini movies they created and I felt like they accomplished so much in such a short amount of time. Although playing with elephants was an all time favorite moment, I would have to say the homestay was the highlight of my experience. At one point I remember sitting at the dinner table, surrounding with piles of dishes of amazing food, with everyone around me speaking a language I didn’t understand and it was the first time I felt like I really experienced the culture of a foreign country. This entry was posted in 2015, Malaysia, SK Temai and tagged Digital Story. Bookmark the permalink.